I have spent a lot of time, in a lot of posts, talking about balance. Though it is not necessarily fundamental in culinary, it can, in my opinion, be the measure by cooks are evaluated. When a new cook steps into my kitchen, we usually have a try – out day (stage we call it). Sit down, get the interview over with, ask the basic questions, go through the motions. At the end, if we’re still interested, the next step is cooking. Get the guy in the kitchen and see what he’s all about. A chef will not hire a cook who cannot cook, or who’s food lacks in basic flavor. That means the end result, the food being presented, has to have all the right components. Proper ingredient pairing, cooking technique appropriate to ingredient selection/final product, demonstrating a solid grasp of the chosen technique, ability to flavor, and ability to balance a dish. Get it right, get the job. Here you are, making a thick bisque style soup. Maybe lobster bisque. Lobster bisque isn’t easy, but you’re ambitious. You follow the steps I gave you, omitting nothing (http://chefnotebook.blogspot.com/2012/08/lobster-biqsue.html), and you are at the final stage. The last and final seasoning. And it tastes bland. What do you do? Panic? No, but clearly, something is missing. You cannot blame me, I told you to check the seasoning. Okay, so step by step, break down the flavor profile and identify the problem. Chances are, you need to add salt. So add salt until the flavor is developed. Your brain is telling you not to add any more salt. Better? Quite, but still something missing. Acid? Does it need to be brighter, do flavor need to ‘pop’? Squeeze a lemon in there. Maybe it needs a hint of heat, like a shake or two of cayenne pepper. In other words, now it’s good- really good. Good enough to ‘wow’ your guests. You enhanced the flavor. But now you’re asking yourself, what will make this better? Is it as good as it can possibly be? Is there anything, anything at all, that will make this a little better? And when your answer is no, you know balance has been achieved. That’s what I used to tell my young cooks. That is attention to detail. That is cooking. That is teaching yourself that balance is really the art of making food delicious. You cannot cook great food without tasting it throughout the entire cooking process. Tasting food is critical. It separates the three and four star restaurants. Cooks hate it when a chef tastes their food. They know that if they themselves did not taste it (the cooks), it’s probably wrong, and will have to make it again. That’s the gig. Balance is tough, but when you start small and work up (start with the glazed carrots and work up the lobster bisque) you’ll develop your palate. You’ll learn what’s missing, or what will ‘complete’ your dish. You’ll learn how to build flavor in steps. You will be better, produce better results, and all of a sudden, you’re cooking with finesse. 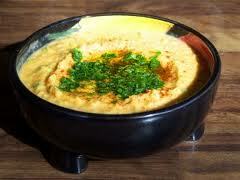 Hummus is a great example of a food that requires a great deal of balance. I suggest adding hummus to a lot of dishes, but you’ll notice, I have never included a recipe. This is because hummus is not a recipe friendly dish. Yeah, sure, 2 cups of cooked garbanzo beans, 1/2 cup tahini, etc etc, but hummus, real hummus is made with a certain touch, a certain sense of flavor that requires the cook to on top of his game. So I will give you my hummus recipe, but bare in mind, balance is crucial, fundamental even, and if you aren’t confident in your ability to taste food and make a decision – what does it need!?! I would hold off on this and develop your palate until you’re ready. Cut the garlic heads in half and place them in a small, heavy bottom, sauce pot. Barley cover them with oil and salt liberally. Bring to a low simmer, and cook, low heat, and until extremely tender and slightly browned. Remove garlic from oil, let cool, and cool the oil. Reserve the oil (this will take about an hour). In the bowl of a food processor, add the garbanzo beans, half the lemon juice, paprika, tahini, sesame oil, a liberal amount of salt, black pepper and the scallions. Squeeze the garlic into the bowl. Run the machine, slowly adding the garlic oil until a very smooth paste is created. You will need to scrape down the edges several times. Now is the tricky part. Taste the hummus. What does it need. If it’s bland, right away, add more salt and lemon juice. Add more paprika if necessary. It should be very smooth, so if it’s gritty, add more garlic oil. Like the sesame, but not getting enough? Add more sesame oil and a little more salt. Keep trying it and adding what your brain is telling you to add until it’s delicious. Don’t try to replicate hummus someone else made at a restaurant. This is yours, so keep at it until you like it. Serve with anything and everything wonderful hummus. Grilled pita with olive oil, roasted olives, roasted pepper salad with sherry vinegar, or use it as a side. Whatever you choose, I’m positive it will be wonderful.